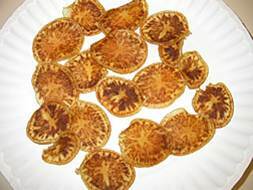 Apple maggot is a native pest of the eastern United States and Canada. In 1979 it was discovered in Oregon and has since moved into California, Washington, and other Western states. 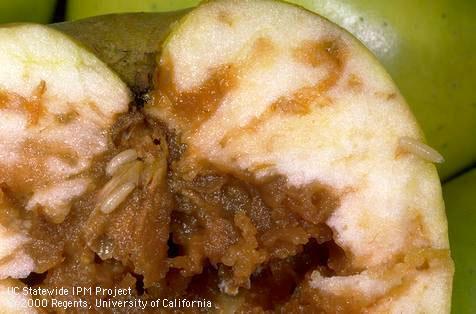 Female apple maggot adults deposit eggs singly under the apple skin. Damage is caused when larvae burrow and feed on apple flesh. Browning of the trails occurs as the apple responds to this injury and bacteria associated with maggots cause fruits to rot internally. No Western commercial apples have been infested with maggots thanks to spraying trees outside the orchards to keep them away. “The first detection of this species [apple maggot] infesting apples in western North America occurred in the United States in Oregon in 1979; flies were caught in neighboring Washington the following year. However, no commercial apples from central Washington, the major apple growing region in the United States, have been found to be infested by R. pomonella, even though adults were first detected within this region in 1995. In Washington, an R. pomonella quarantine is established in 22 counties, including two under partial quarantine. R. pomonella is widespread and abundant in Washington west of the Cascade Mountain range, but is much less abundant in central and eastern Washington except in Spokane County. It occurs in low numbers on the margins of the apple-growing regions in central Washington in native hawthorns and in even lower numbers in unmanaged roadside and backyard apples. Authors: Yee, W. L., et al. Title: Status of Rhagoletis (Diptera: Tephritidae) Pests in the NAPPO Countries. Source: J. Econ. Entomol. 2014. 107:11-28.